You can learn how to mix an endless amount of greens with just a handful of tube colors. It’s true, there are some very nice tubed greens on the market today. Thalo Green and Thalo Yellow Green for instance, are two of my favorites. 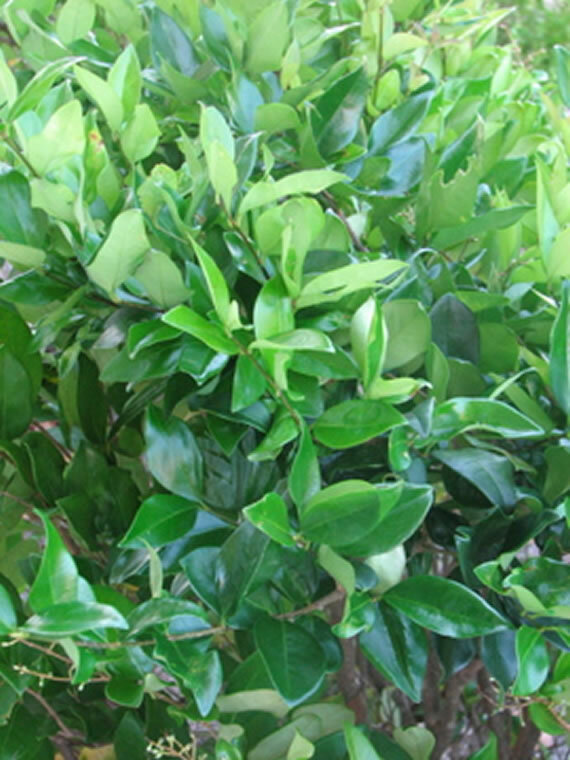 I use these two greens if I am outdoors painting and I don’t have the time to mix my own greens from scratch and believe me, they come in very handy sometimes. Apart from those two, I have no other greens on my palette. Everything else I mix from various blues, yellows and other colors. If you aren’t a landscape painter however, then you can probably get away with using tubed greens, but even tubed greens may have to be modified depending on your particular subject matter. Using colors straight from the tube can be too intense sometimes. If you do a lot of landscape painting however, then you should really learn how to mix your own greens. The key is to use a variety of different blues and yellows along with other colors from your palette to create paintings that are alive, fresh, different. Why so many different colors you ask? If you spend time outdoors in nature, you will most definitely notice the vast amount of green that is there. But have you ever taken the time to carefully observe this color? If you look closely , you will see warm yellow and orange greens, cold blue and violet greens, dull grayish greens . 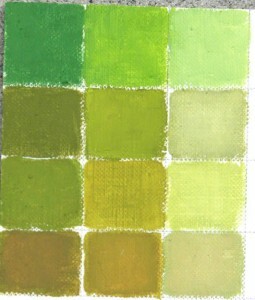 So it will be much easier to paint those greens on canvas if you have a variety of colors on hand. Observe the photograph to your left (click image to enlarge). That is a small bush in front of my home. Can you see the different greens? Can you tell which are warm and cool? Bright or Dull? Mixing your own greens is exciting and a great learning experience. You will have a deeper more intimate understanding of the properties of your pigments and it will make you a much better artist in the long run. You will also have a chart of colors to reference over and over again. (If you plan on making your own color charts, just be sure to label them with the color mixtures you used so you can reference them again in the future. ) No guesswork and no wasted paint. Besides, once you see how many different varieties of greens you can mix from a small handful of colors, you are going to be hooked. 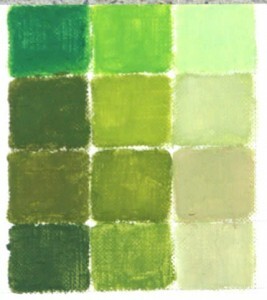 Below are three different color charts comprised of 36 different greens. I created these color charts from the following tubed colors: Cadmium Yellow Light, Lemon Yellow, Cerulean Blue, Thalo Blue, French Ultramarine Blue, Cadmium Red Light, Cadmium Orange, Alizarin Crimson and Titanium White. The specific color mixtures are explained in more detail below each image. This first block of colors was created from the following tubed colors: Cadmium Yellow Light , Cerulean Blue, Cadmium Red Light, Cadmium Orange, Alizarin Crimson and Titanium White. The first two columns of the first row are two values of Cadmium Yellow Light mixed with Cerulean Blue. The last column is the same mixture only tinted with Titanium White. 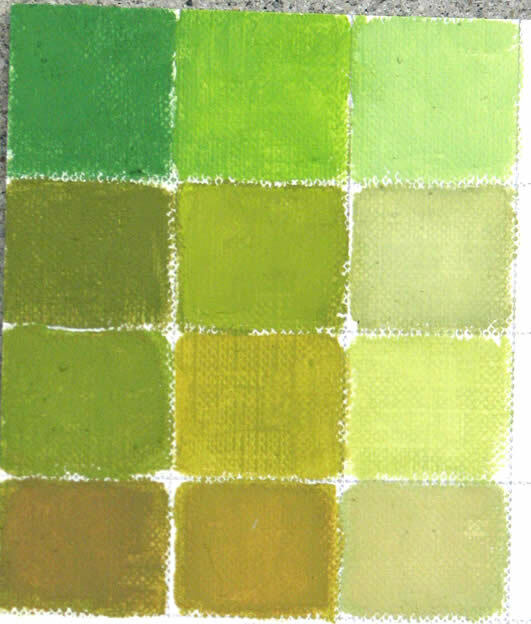 The colors of the second row are the same mixture with a touch of Cadmium Red Light. The colors of the third row are the same mixture with a touch of Cadmium Orange. The last row is again the same mixture with a touch of Alizarin Crimson. This second block of colors was created from the following tubed colors: Cadmium Yellow Light , French Ultramarine Blue, Cadmium Red Light, Cadmium Orange, Alizarin Crimson and Titanium White. The first two columns of the first row are two values of Cadmium Yellow Light mixed with French Ultramarine Blue. The last column is the same mixture only tinted with Titanium White. This last block of colors was created from the following tubed colors: Lemon Yellow, Thalo Blue, Cadmium Red Light, Cadmium Orange, Alizarin Crimson and Titanium White. The first two columns of the first row are two values of Lemon Yellow mixed with Thalo Blue. The last column is the same mixture only tinted with Titanium White. The colors of the second row are the same mixtures only a touch of Cadmium Red Light has been added. 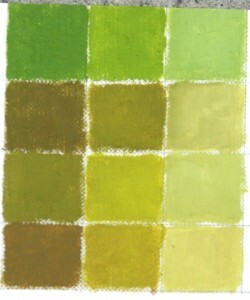 The colors of the third row are the same mixtures only touch of Cadmium Orange has been added. The last row are again the same mixtures only a touch of Alizarin Crimson has been added. The above colors are just a very small fraction of the greens that are possible when mixing Yellows, Blues and other colors on your palette. Other colors you could use are Yellow Ochre, Cadmium Yellow, Prussian Blue, Cobalt Blue and Ivory Black to name a few. So grab your paints and start making some of your own color charts and see what kind of greens you can come up with for your next painting! This sounds like the ONE! I’ve been using Acrylics since I started painting about 15 yrs. ago. I took a very long break, because I discovered music! I was out playing proffessionally at 17. Anyway I’ve finally slowed down enough to “stop and smell the roses” at 48 and I think I’m ready to start using oils. I love your work Man. If I may ask a question; Would you recommend starting out using the faster drying oils? I have limited space; (a living room). Plus they make low odor cleaning soloutions as well. Thank you, and I hope that someday, I can be the artist I really want to be. Mixing greens is important to me because I like to add many types of trees to appropriate works. They can cover a lot of mistakes in the background. Painting grass and weeds is very hard for me I would like all the tricks and advice that I can get from any artist in the Facebook group.